An Annual Drama Festival takes place in March. The local committee works through the year to organise troupes from Wexford to Derry bringing together a week long programme which forms part of the All Ireland drama festival. This is an example of where a new comer to town could enjoy being part of a successful team effort. The musical society welcomes new members all the time, recent productions includes old out performances of Seven Brides for Seven Brothers, Anything Goes and Annie. A strong tradition exists and numerous concerts and events are staged through the year, most notably Scor which is a GAA competition. Ballinamore Sean O'Heslin's Club and clubs in the surrounding parishes have been very successful in all sections of traditional music, song and dance and most notably in the Novelty Act which has been won by the Ballinamore Club on numerous occasions at All Ireland level. Service provides collection for adults and children: hold events to suit all ages, presenting a broad range of workshops, fun activities and cultural events to school children and the wider community.The Library celebrates major festivals such as: Bealtaine, Heritage Week, Children's Book Festival and Ballinamore Annual Family Festival. The exhibition/lecture area has integrated audio visual facilities. The childrens's area has a sensory panel. Free internet access and WiFi facilities available to all members. Local groups are also invited to use the exhibition/events space for meetings, etc... Free of charge!!! Local Studies Library has a huge collection of local material to help researchers and those tracing their "Leitrim Roots". This includes books, files, maps, photographs, newspapers (dating back to 1822), manuscripts, roll books and registers of most Leitrim schools, journals, recordings of interviews with older people and a large video collection. Irish language is alive and well in Ballinamore as you will even notice in the wording on shop fronts. 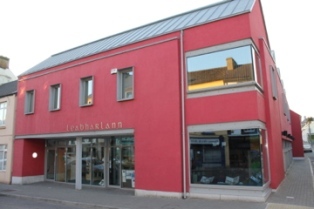 The Leitrim County Library hosts a weekly comhra (conversation in Irish) in winter, catering for beginners, improvers and rusty Irish speakers. It is sociable and fun and enables participants to improve their Irish in a very enjoyable way.Comhrá Gaeilge for 1st year students from 7pm to 8 pm and Comhrá Gaeilge for all other groups: 8pm. This group continues through the summer in the informal setting of McGirl's pub. Readers Group meets weekly in the Library. The newly formed Ballinamore Writers Group holds their weekly meetings in the Library each Monday at 10am. New members welcome, no need to book in advance, just come along on the morning. Knitters Group: Tuesdays at 11am. Draughts Club: Tuesdays from 6.30pm to 7.30pm. Mother and Toddler Group: Wednesdays 10am to 12noon. For details contact Laura at 086 6035977. Kiddies Movie time each Saturday at 2.30pm. Details of weekly movie available from the library. Offers support and services including support for individuals and families, Personal Development Programmes, Parenting Programmes, Education Courses and Training Opportunities, activities for children, advice and support around housing and social welfare, advice around support groups. For more information call Laura in Mohill Family Support Centre on 071 96 31253. Spanish Conversation Classes for beginners in Ballinamore Library every Thursday From 6.30pm to 7.30pm. Booking essential. Contact the Library at 071 9645566. A group of John Mc Gahern enthusiasts meet around the time of the Annual John Mc Gahern summer school, this alternates between La Nua and the Cultural Quarters, the latter being the building which was the original Garda Station where Mc Gahern’s father was stationed when he first came to Ballinamore in the 1920’s. The public exhibition space of Ballinamore Community Arts Group. This is an artist led gallery located over the Four Seasons Florist & Garden Centre. Admission is free and visitors are always welcome to browse.We have a new exhibition every month showing local and national talent.The Galery is run by a committe made up of members. Ben and Gail Quinn are the people on the ground. This member's led gallery is open to all artists and offers an opportunity for them to exhibit publically in a friendly, supportive environment. Contact Ben or Gail for details of membership. For those looking to see some up and coming talent, this is an ideal place. Many exhibitors are well established but many more are up and coming new talent and this may the first time they have exhibited publically. The atmosphere is welcoming and informal. A good spot to spend a leisurely half hour! Leitrim Genealogy Centre was set up in 1986 to deal with enquiries from people who wished to trace their Leitrim ancestry. Leitrim Genealogy Centre is the official genealogy service for County Leitrim, is a part of the Irish Family History Foundation's network of Centres throughout Ireland and provides a full time professional genealogy service for County Leitrim. Leitrim County Library apart from a huge selection of books, has an extensive archive of newspaper records facilitating research and genealogy studies. The library is a very valuable resource in the community, its separate meeting area hosts lectures on various topics of interest as well as facilitating readers groups and discussions. It also provides internet facilities to the public. Glenview Folk Museum features selected memorabilia previously housed in Leitrim County Library Ballinamore. The museum consists of many different attractions from old household & farm items to vehicles and a full street scene which has been fully reconstructed to really give you a feel for 1930's Ireland. 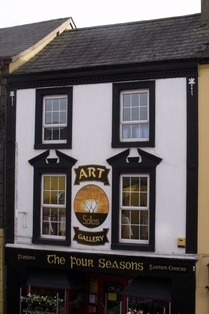 Solas Art Galery has ongoing exhibits featuring both local and national artists showcasing their paintings, drawings and sculpture. Live music is staged in a number of venues in Ballinamore throughout the year, Mc Girl's brings international names, while other pubs in town host local and national artists. Cowboys & Heroes Festival and Ballinamore Family Festival brings you concerts with Country Music Stars. Free Fringe Festival showcases a variety of new and established music acts.